Home - If my lawn is brown, is it dead? If my lawn is brown, is it dead? So, I thought I would look into this common issue with gardens as mine is currently brown and I am concerned it is dead! I have asked our Twitter friends if they can help and if they have any advice for me and my sunburned garden. Nobody wants the view from their Anglian conservatory to be a brown, straw-like lawn, we want plush green havens to make our neighbours jealous. Thanks to DIY Doctor for highlighting a recent press release by turfgrass.co.uk which described why my grass has turned brown. It turns out my worst fears are not true and grass is in fact very robust, simply shutting down whilst a heatwave sets in. If your lawn is not newly laid and has established roots, you needn’t water it every day during a heatwave as it is just a waste of water. As my lawn is already like straw, brown and is not freshly laid, it is recommended to leave it until rain returns, at which point the resilient little lawn will return to full strength and greenness. 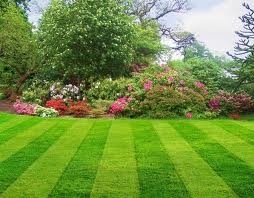 During intense heatwaves and a severe lack of water, a lawn will stop growing and turn brown as a defence mechanism. It will lay dormant until it either has a good soaking from a hose or from the heavens opening. Should your grass be on the turn during dry conditions, do not cut it. If you want to try and retain the vibrant emerald glow to your garden, water deeply and infrequently to help your grass establish deep roots to search for moisture. It is quite a relief to read that my lawn isn’t dead as laying new turf can be a pricey affair and if I’m honest, I’m a terrible gardener!